This fall I decided to pull up all the English ivy (Hedera helix) in my yard, something I’d been meaning to do for 20 years. I was pushed into action by hordes of Asian tiger mosquitoes (they hide in it) but there were other reasons, too, and I thought I’d post the complete list in case others might be on the fence about this invasive, destructive, non-native weed. If you are convinced after just a few reasons, please skip to the bottom to see eradication tips (videos, etc.). If you don’t have any ivy but hate it with a passion, please go to the section on how to help get the word out — there are hundreds of millions of English ivy fans and we need to reach a few of them. Harbors mosquitoes. Provides ideal spot where mosquitoes can avoid desiccation on hot, dry days. Indeed, when you hire a company to come spray for mosquitoes, they focus on the English ivy. Dense cover on ground, houses, and trees also attracts mammals and birds (below) that provide blood for local mosquitoes. Ivy can also obscure puddles and water-filled trash where mosquito larvae can mature (I found a water-filled Wiffle ball under mine). Please note that any super-dense ground cover has all these attributes, but English ivy seems to be at top of the list in encouraging mosquitoes (per many mosquito biologists, pesticide companies, etc.). Harbors ticks. Just like mosquitoes, ticks desiccate rather quickly in the sun so they tend to lurk in dense vegetation until sensing a mammal. Again, true for any vegetation but for something that can attain such thickness, English ivy is especially good at harboring ticks. Ticks also follow rodents, which adore English ivy. Harbors slugs and snails. They thrive in the moist shade but of course wander off into your vegetable garden to do sluggy things. Harbors rats. They use it is as cover and also as ladders to climb up buildings and trees. Harbors raccoons. They hang out in in the mature (reproductive) parts that are high up in trees. Raccoons are native and adorable but make a racket at night. Plus if you have them in your yard they will target your trashcans and compost pile. Trust me. Harbors voles. Voles use the cover to gnaw on the bark of trees (photos). Without the ivy the voles are too scared to venture out in the open. Harbors snakes. People clearing English ivy seem to regularly encounter snakes, sometimes lots of them and sometimes venomous (e.g., copperheads). I like snakes a lot but if you have pets and kids running wild through the ivy, you might have a different view. By the way, snakes are in your ivy to eat the rodents, birds, toads, salamanders, and insects that like to hang out in the dense foliage. Some snakes are even eating slugs (don’t judge). Attracts house sparrows. Passer domesticus is sometimes referred to as English sparrow and it’s from Europe and invasive just like ivy. Because they evolved along with the ivy they can tolerate, and like, the toxic fruit and will descend on the vines in large flocks. They will also make their nests on trees and buildings that have walls of ivy. E.g., a church in Providence had 970 sparrow eggs in the ivy covering the exterior. House sparrows are aggressive and displace native birds by fighting over food and nesting sites. They are known to kill other birds. House sparrows probably transmit diseases to chickens. Attracts English starlings. This species can also detoxify English ivy fruit. These are even more gregarious, noisy, invasive than house sparrows (see this pp 246-7 of this book). Starlings also kill native birds (bird fans kill them whenever they have a chance). 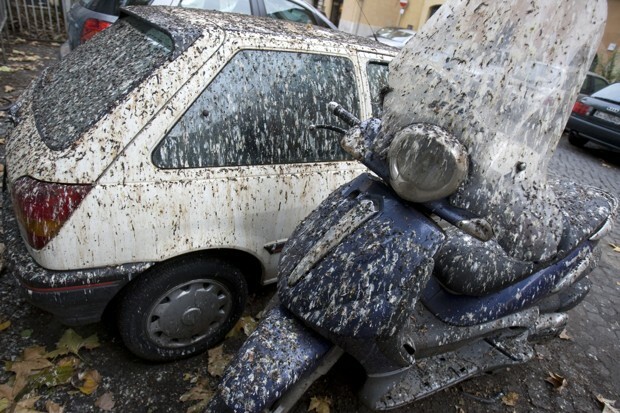 Starling poop contains pathogens (e.g., Histoplasma capsulatum) and damages car finishes. Large flocks under English ivy can generate so much poop that a slick develops, presenting a slipping hazard. Starlings also have a tendency to fly into jet engines, in large numbers, which tends to be bad. Here’s an Audubon take. Harbors pests of other plants. There are dozens of insects and mites that eat English ivy but that are equally happy eating other plants in your yard. Here’s a review of such pests for residents of San Francisco. Harbors diseases. E.g., English ivy gets bacterial leaf scorch (Xylella fastidiosa), a disease leafhoppers and sharpshooters can easily transfer to ornamental trees such as American elm, red maple, and oaks. Hides tree damage. E.g., you can’t monitor your favorite tree for emerald ash borer or spotted lanternfly if you can’t see the trunk. Girdles trees. The compressive force of established English ivy stems can deform tree limbs and causes decreased growth. Starves trees of light. When English ivy makes its way in to the canopy of a tree, lower branches of the tree get shaded die, leading eventually to the dreaded, “broccoli head” look. Steals water from trees. After decades of growth the root layers of English ivy are so dense that water rarely makes it down to where tree roots might be. The lack of water can kill younger trees but can also alter the root architecture of established trees. Makes trees prone to toppling. The added mass in the canopy is only part of the problem — the evergreen leaves of the English ivy catch the wind, increasing the risk of a tree being blown over in a winter storm. And during winter, snow and ice can accumulate on the vines, further adding to the weight. Makes tree work more expensive. An arborist may charge you more for climbing a tree covered with English ivy. That’s because the risk is so much greater and the work proceeds more slowly. They reasonably might refuse to climb them. Destroys shingles, shutters, gutters, security cameras, satellite dishes. Roots and stems can burrow into small spaces and then expand, splitting apart structures on the outside of your house. Hinders house painting. If you have ivy on your house you’re probably not going to be motivated to repaint in a timely manner. And if and when you do decide to rip the ivy off, bits of root will stay attached for decades and will need to be scraped off before repainting. Removing the roots can also pull off paint that is thinking about flaking. Weakens mortar. Stems can sneak into gaps in mortar and then expand. Older houses with lime-based mortar (cement-based mortar is stronger) are especially vulnerable. Weakens house foundations. Vines start off as small sprigs in cracks along edge of house but can grow up to a foot in diameter and can damage the house. Increases house flammability. Fire can more easily climb up to more flammable parts such as window frames and roofing. This type of vegetation is termed a “ladder fuel“. Encourages termites. The shade and humidity around the base of your house almost guarantee that termites will move in. And because ivy blocks the view you won’t even realize you have an infestation until you try to sell your house. Can cause structures to collapse. If you have a poorly-built shed or fence the added weight of the vines might eventually be too much. It happens. Increases house insurance. For all the reasons above, this outcome seems reasonable. This post claims that English ivy can result in damage that might not be covered in Massachusetts. Might be true elsewhere, too. Causes erosion. I know, I know — experts say that English ivy’s redeeming feature is its ability to control erosion. Sadly, they are not expert enough: the roots of English ivy are simply too shallow and too coarse to effectively grip soil. In reality all the ivy does is kill shrubs and trees that do have deep, fine roots. Facilitates forest fires. Allows fires to climb up trees to reach the more flammable canopy. Also allows fire to creep along the ground, bridging trees that might otherwise be too distant for the fire to travel in the air. FYI, it’s really hard to rake leaves in a forest when the floor is carpeted with English ivy. Emits a bad odor. Volatiles from flowers are sometimes described as similar to sewage. Other descriptors are less generous. Causes honey to taste and smell bad. The odor (see above) imparts an odd taste to honey. Per one fan, flavor is “strong and somewhat unpleasant but becomes good tasting with time.” There’s a company that sells it if that sounds great. Kills native plants. Deprives them of moisture and light, and often pulls them to the ground. Even if you don’t care about native plants, walks in the woods are boring if it’s just a carpet of English ivy. Prevents native species from germinating. Again, English ivy is a bully: takes all the water and blocks all the light. See Biggerstaff et al. 2007 for details. There’s even some evidence that something is exuded by roots or leaves that suppresses germination of nearby seeds. Reduces native pollinator populations. English ivy produces flowers when it reaches the canopy, but until then it just kills all the other species that used to provide nectar and pollen to bees and butterflies. Many pollinators require a particular kind of nectar and pollen so that means an English ivy monoculture will cause local rarity or extinction of these insects. Similarly, most caterpillars require a particular kind of host plant and English ivy kills those hosts. Eliminates habitat for ground-nesting bees. Certain species require uncovered ground and thus cannot survive with a dense mat of English ivy blocking their digging efforts and flight patterns. Might harm native birds. I’m not positive about this, but it’s likely that the toxins in the fruit are harmful to some species of native birds. It’s reported to be toxic to chickens (which are not native, of course, but we like them nonetheless). Causes dermatitis. If using a weed trimmer while wearing shorts, it can be unpleasant. Caused by falcarinol if you’re curious. Seems to affect only 10% of humans. Causes allergies. This only affects humans who have an allergy to English ivy pollen, but if that’s you and you don’t realize it, that’s a problem. Causes death. No human has died from the toxins in the leaves or berries but cows have. So if you have a child or a pet who likes to nibble on foliage, this risk is real. FYI, only human death from eating English ivy was a suicide (he suffocated on leaves). Causes hypersalivation and abdominal pain. The plant causes all sorts of problems if pets eat the leaves. Encourages use of gas leaf blowers. Fallen leaves on beds of English ivy apparently drive Type A homeowners to distraction because they just can’t be easily raked (e.g., discussion 1, 2). 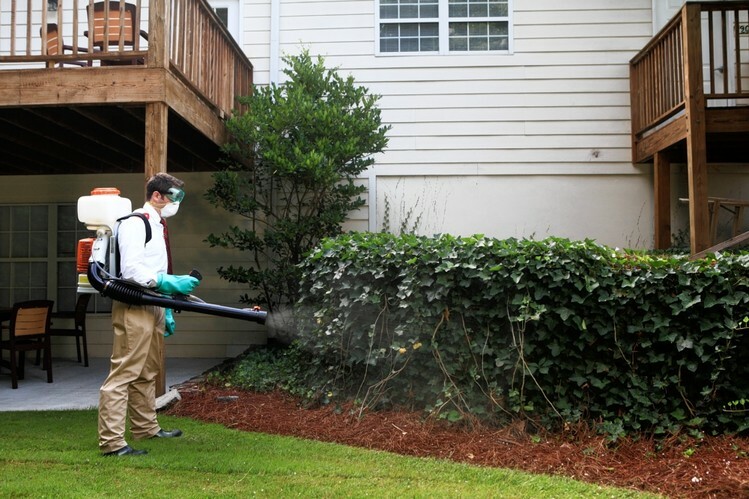 So homeowners hire lawn-care crews to blast the leaves with powerful, two-cycle, jet-pack blowers. It’s good exercise! Pulling up ivy burns approximately 400 calories per hour and works a variety of muscle groups. If you have a big yard you’ll be totally ripped and ready for the beach. Plus, considerably cheaper than a Peloton bike ($1,995 plus monthly fee) and you don’t need to buy fancy tights. Note: the list applies equally well to Atlantic ivy (Hedera hibernica), Algerian ivy (Hedera canariensis), and numerous other Hedera species and cultivars. Many garden centers sell these with a “non-invasive” label but they add that text just to sell them to unsuspecting customers. If you have questions or suggestions, please send me an email. This page by the Invasive Species Consortium has loads of good information, links, and citations. Linda McMahan (Oregon State University) also has a fantastic brochure with excellent photographs. If you have questions, please send me an email. The key to success is to just do a small patch at a time and keep at it, even if it takes years. You just need to start. Here’s a great time-lapse to get you in the mood. And then you need to revisit the de-ivied areas monthly to pick out the parts you’ve invariably missed, but that’s the easy part. If after a few patches you realize it’s not for you (likely) just hire a group of teenagers. I’m suggesting a group because it’s mind-numbing work that is easier to endure with friends who are also suffering. But it’s also true that teenagers get competitive with each other and can better power through a task when they see a way to remove ivy faster than others. Pay them well and give them bonuses to keep them motivated (I specialized in root removal when I was a teen and it’s hard work). PRO-TIPS: If you have kids of your own, put ivy removal on the chore list. Or make your teens do it instead of grounding them when they do something terrible. And don’t forget to put “get all ivy removed” on your birthday and Christmas gift list. Here are some motivational examples of groups organizing to rid natural areas of English ivy. Some links are old but still give a sense of how to pitch to public. Share this post with others on Facebook, Nextdoor, etc. Print out the 1-page summary and post it somewhere (e.g., public library announcement wall). Or hand out at a meeting. Or leave on kitchen table for spouse to see (write, “I told you so,” at top). If you like posting photographs online, consider staging a nice before-and-after pic of your garden or house. If you have a teen looking for employment, encourage him or her to offer English ivy removal services, an unfilled niche in almost every town in the country. If you like guerrilla marketing campaigns, print up some signs that might connect with the general public. E.g., “English Ivy Kills Trees“. If you’re a member of a garden club, get everyone on board with a no-ivy stance. If you have a landscape design business, advise clients to remove their English ivy. Take high-quality before and after photographs to use on your website. Show those pics to clients and convince them that native plantings are better. Start an ivy-removal business. Like I ❤️TREES IVY REMOVAL in Asheville, NC. If you’re an arborist, educate homeowners about English ivy’s effects on trees. Add that information to your webpage, too. And when you offer estimates say that you can give them a better price if they first remove the ivy from the trees. If you’re a florist, don’t use English ivy. If you work at a garden center, make sure you don’t sell English ivy, even as a houseplant (people invariably plant it outside). If you see English ivy for sale, encourage store to stop. E.g., I’ve asked Trader Joe’s to stop selling it’s “Ivy wreath with fairy lights” (please join me). If you have mad social media skills, petitions are great. If you’re an extension agent, don’t suggest that English ivy can be a useful plant. Seriously, stop doing that. Or at least suggest kudzu, instead, so that citizens better realize you’re unqualified. If you’re a biology teacher, use English ivy as an example of an introduced species that has massive ecological effects (there’s a good literature). Each student who is paying attention is one person who will be less inclined to plant English ivy if and when he or she grows up. If you’re involved in governance, kick off an Ivy Free Town initiative (e.g., as Vienna, VA did). Or add English ivy (and kin) to the list of noxious weeds that cannot be planted or sold. At the very least, encourage homeowners to remove it. Oregon banned it in 2010 (even in floral arrangements). California is trying. If you own a tree farm, allow English ivy to grow up several dozen trees, then take photographs every few years to show how their growth is reduced relative to nearby trees. Would be virally good. If you’re a Girl Scout or Boy Scout, find a local park that has an English ivy problem and fix it. Don’t just do it yourself — organize work days so that dozens of your friends come to help. This can get you a badge (or whatever) but also helps educate the whole community. If you hate ivy and have friends, organize a group that goes out and kills it. This tradition dates back to Queen Mary’s “Ivy Squads” in the late 1930s. Two modern examples: Silverton Remove Invasive Plants Squad (Facebook), Salem No Ivy Coalition. If you’re a botanical garden, plant a WARNING sign inside a very small patch of English ivy that is growing up a tree. The sign should detail the destructiveness of the ivy. The goal is to shock viewers out of their love of English ivy. If you’re a member of the American Ivy Society, run for president. Once you’re firmly in power, redo website to acknowledge that ivies, even cultivars, can be highly invasive and should never be planted outdoors. State that even when a breeder thinks a new cultivar isn’t invasive it should be treated as such anyway. And be a vocal supporter and funder of eradication efforts. If you’re young and attractive, use your looks to help shift normative behavior. E.g., post a photo of yourself pulling up ivy (show muscles, mud splatters, etc.). E.g., here’s an Instagram post about invasive Phragmites. I also like this, this, and this. Or post a pic of you planting a native flower near a huge pile of freshly-grubbed ivy (“I native plants…”). The effect of a virally-good post is more valuable than donating thousands of dollars to invasive species control efforts (do both if you can). Here’s an interesting paper on how to craft ads that influence normative behavior (e.g., focus caption on helping native plants). Fun fact: Edgar Allan Poe was an influential proponent of planting English ivy (listen to podcast with Dr Ellen Bayer). As you pull ivy, curse Poe (nevermore, ivy, nevermore). He is also partly to blame for American’s uncritical fondness for turf grass. This entry was posted in Biology, Gardening and tagged aerial roots, English ivy, garden design, gardening, gardens, Hedera, Hedera helix, Hedera hibernica, hederaphobia, invasive, Irish ivy, ivy, ivy desert, liana, mosquitoes, non-native, noxious weed, perennial, weed on November 16, 2018 by Colin Purrington.